When certain materials are subject to extreme heating, they lose their permanent magnetic properties and instead obtain an induced magnetisation. Consequently, the material acquires a thermoremanent magnetisation and can be detected by magnetic geophysical surveys. Two examples of archaeological features with thermoremanent properties include areas of burning, such as hearths, and features containing burnt deposits, such as pits. By identifying areas of burning within magnetic datasets, it is possible to suggest the extent and type of human interaction with their local landscape. Unfortunately, anomalies associated with burnt deposits can appear as amorphous areas of varying levels of increased magnetic readings, and so can be difficult to conclusively interpret. This is largely due to the varying properties of these features. Often areas of burning lack clear edges, or a definitive shape; and their magnetic properties depends on the type and concentration of burnt material within the deposit. However, if areas containing burnt materials are located in proximity to other archaeological features then our confidence in their interpretation increases. 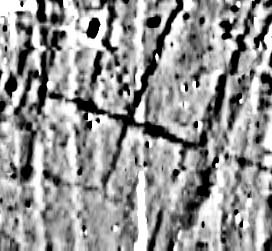 For example, if a data set contains rectilinear anomalies belonging to a buried structure, then amorphous areas of increased magnetic readings may be indicative of a burnt area, such as a hearth; or if there is a coherent defined patterning or grouping of such anomalies then this may suggest a series of pits. One common organic material found in burnt deposits is charcoal. Charcoal patches are either formed due to lightning strikes, or as the result of human exploitation of fire. Whilst the former was of unfathomable importance to the cultural evolution of our earlier hominin ancestors, the latter is a substantial source for describing environmental conditions in the past and our principal domestic and creative activities. From preserving cooking residues and spent fuel to the preservation of discarded agricultural refuse and fragments of obsolete objects, charcoal studies are central to bio-archaeological research. Note the distinction between charcoal that may have been an artefact (for example bucket staves, an axe handle or a chest) and ecofacts (all other plant remains that are the product of deliberate or inadvertent charring). Though it is speculative to distinguish between willow branches that were a woven basket (artefact) or kindling (ecofact), unless some of the structure preserved, the retrieval of exotic wood may suggest it was part of an object. Silver fir for instance, were brought to Britain for construction. Walnut or cedar wood was used in furniture and beech or larch in boat building. Although the wood may have a secondary purpose as fuel (dull archaeology), it likely first constituted an artefact and can, as such, be illustrated in books or even exhibited (heritage).